Flow cytometric staining of Jurkat cells with preservative free Mouse anti Human CD166 antibody, clone 3A6 (MCA1926XZ), filled histogram, with Mouse IgG isotype control (MCA928), open histogram. 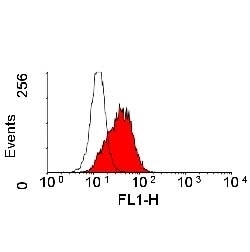 Flow cytometric staining of Jurkat cells with FITC conjugated Mouse anti Human CD166 antibody, clone 3A6 (MCA1926F), filled histogram and FITC conjugated Mouse IgG1 isotype control (MCA928F), open histogram. Mouse anti Human CD166 antibody, clone 3A6 (MCA1926) used for the evaluation of CD166 expression on umbilical cord derived mesenchymal stem cells by flow cytometry. Flow cytometry, Immunofluorescence and qRT-PCR of WJ-MSCs. (A). Representative flow cytometry of WJ-MSCs (n = 3). Cells express CD29, CD44, CD73, CD90, CD105, and are negative for the hematopoietic (CD34 and CD45) and endothelial (CD106 and CD133) markers. 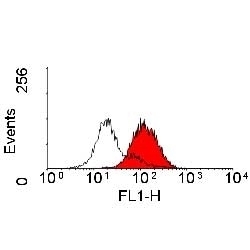 Black open histogram indicates controls signal; red shaded histogram represents positive reactivity with the indicated antibody. (B) Confocal laser images of Immunofluorescence using APEX-labeling system for conjugating primary antibodies; CD29-Alexa Fluor 594, CD34-, CD44-, CD90- and CD133- Alexa Fluor 488. CD73-PE and CD105-PE were manufacturer labeled. 600X magnifications (C) qRT-PCR of the prospective markers for RNA isolated from undifferentiated WJ-MSCs cells, values were expressed as a percentage relative to 1/dCt of GAPDH gene. Multi-Lineage Differentiation of Human Umbilical Cord Wharton’s Jelly Mesenchymal Stromal Cells Mediates Changes in the Expression Profile of Stemness Markers. Mouse anti Human CD166 antibody, clone 3A6 (MCA1926) used for the evaluation of CD166 expression on mesenchymal stromal cells by flow cytometry. Characterization and differentiation of BM-MSC. 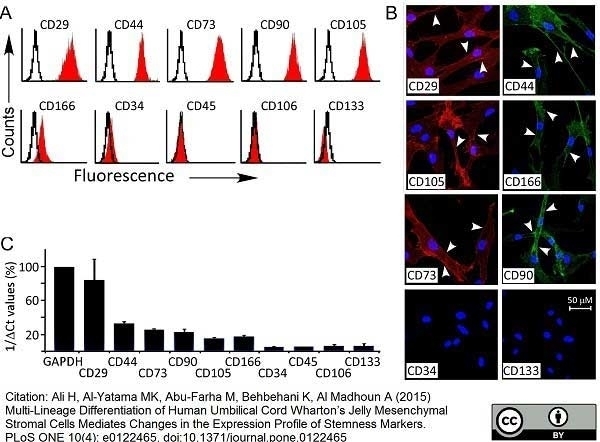 (A) Representative flow cytometric analysis of cultured mesenchymal stromal cells. Solid white represents the isotype control. (B) A. BM-MSC, displayed an homogeneous morphology of fibroblastic cells. Cells were stained with May Grunwald Giemsa staining (40×). Under specific induction BM-MSC were differentiated into (B) adipocytes (lipid vacuoles were colored by Oil Red O, ×40), (C) osteocytes (calcium deposits were revealed by Von Kossa method, ×40), (D) chondrocytes (cell pellet was sectioned and stained by toluidine blue, ×4), and (E) neuron-like cells derived from BM-MSC upon treatment with neurogenic medium (×40). Expression of nestin and MAP-2 after 10 days induction, detected by immunofluorescence (F and G, 100×). 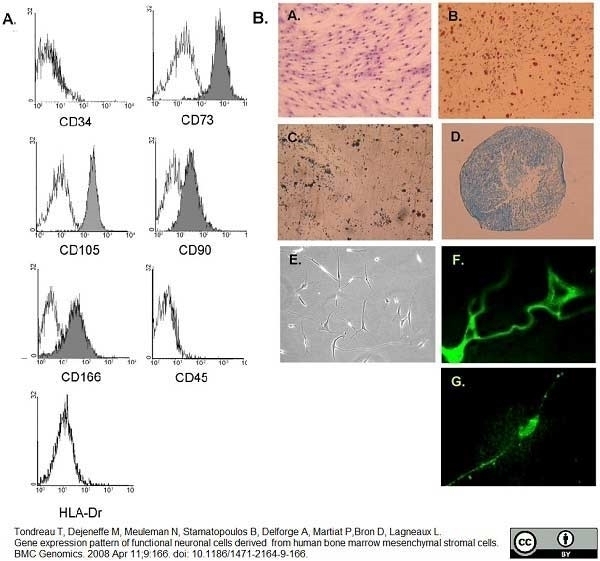 From: Tondreau T, Dejeneffe M, Meuleman N, Stamatopoulos B, Delforge A, Martiat P, Bron D, Lagneaux L. Gene expression pattern of functional neuronal cells derived from human bone marrow mesenchymal stromal cells. BMC Genomics. 2008 Apr 11;9:166. Alexa Fluor 488 conjugated Mouse anti Human CD166 antibody, clone 3A6 (MCA1926A488) used for the evaluation of ALCAM expression on human breast epithelial cells (HBECs) by flow cytometry. ERpos cells are purified and tracked by sequential CD326/CD271–CD166/CD117 FACS followed by multicolour staining and qRT–PCR. Multicolour flow cytometry of uncultured HBECs incubated with CD326/CD271/CD166/CD117 and visualized pairwise (left diagrams) to recover luminal cells (CD326high) and basal cells (CD271high) and from the luminal gate CD166high and CD117high cells. Smears of sorted cells were stained (right panel) with either of the markers against basal cells, cytokeratin K14; luminal cells, cytokeratin K18; luminal progenitors, cytokeratin K15; Ks20.8 or ER–PR and counterstained with DAPI nuclear stain. 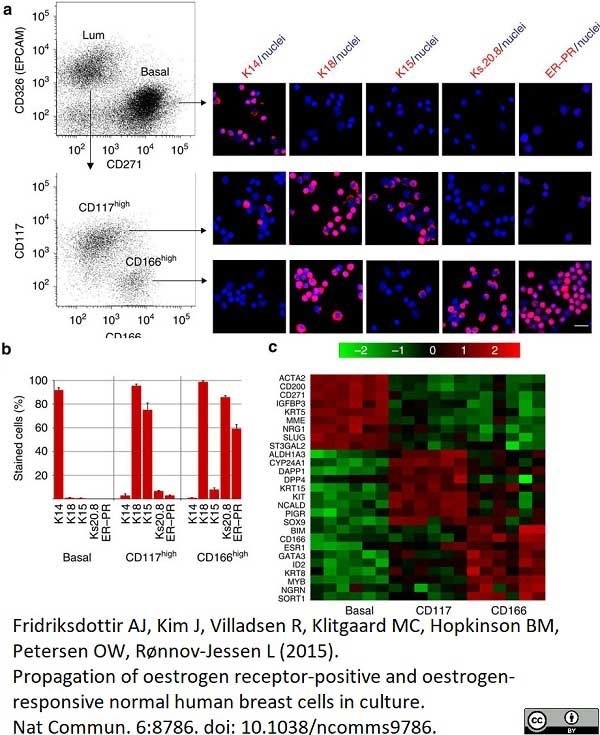 Hormone receptor-positive cells are observed primarily among CD166high cells. Scale bar, 50 μm. (b) Purity of sorted cells as determined by staining of smears followed by quantification of the percentage of cells stained with either of the markers cytokeratin K14, K18, K15, Ks20.8 or hormone receptors (ER–PR; 3 × 100 cells per slide, error bars indicate s.d.'s). (c) Heatmap representing qRT–PCR analysis of the relative gene expression of lineage markers in sorted basal cells (basal), CD117high luminal cells (CD117) and CD166high luminal cells (CD166) from six different biopsies. Data confirm lineage-specific transcriptional profiles of the three cell populations and restricts ER expression (ESR1) primarily to CD166high luminal cells. Colour bar indicates the fold difference of the relative gene expression in log2 scale. From: Fridriksdottir AJ, Kim J, Villadsen R, Klitgaard MC, Hopkinson BM, Petersen OW, Rønnov-Jessen L.
Propagation of oestrogen receptor-positive and oestrogen-responsive normal human breast cells in culture. Nat Commun. 2015 Nov 13;6:8786. Mouse anti Human CD166 antibody, clone 3A6 recognizes the 100 kDa adhesion molecule CD166, also known as ALCAM. CD166 is a member of the Ig superfamily and is expressed on activated T-cells, B cells and other cells including thymic epithelial cells, fibroblasts, keratinocytes and neurons. CD6 has been identified as a receptor for ALCAM (Skonier et al. 1996). Mouse anti Human CD166 antibody, clone 3A6 is reported to cross-react with CD166 on ovine tissues and provides a useful tool for the identification and characterization of ovine mesenchymal stem cells in conjunction with CD44 which is expressed by this cell lineage and the hematopoietic cell marker CD45 which is not expressed on mesenchymal stem cells (Sanjurjo-Rodríguez et al. 2017). Spleen cells from immunised mice were fused with cells of the P3X63 Ag8 myeloma cell line. Yeh, S.P. et al. 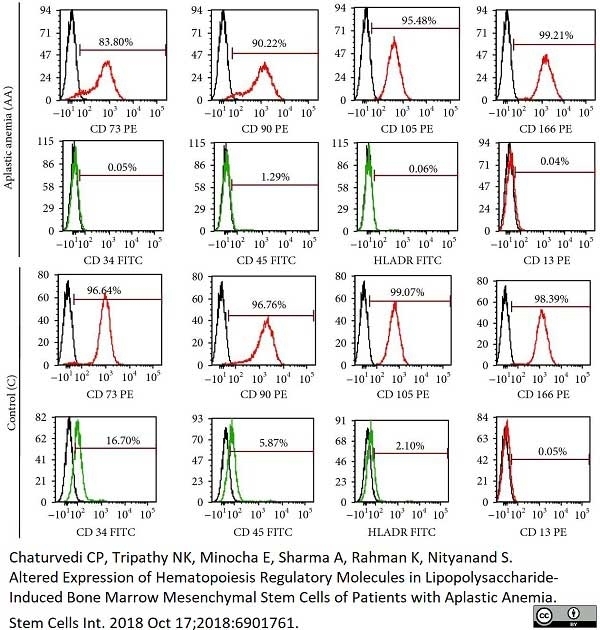 (2005) Mesenchymal stem cells can be easily isolated from bone marrow of patients with various haematological malignancies but the surface antigens expression may be changed after prolonged ex vivo culture. Patel, D. D. et al. (1997) CD166 Workshop: Tissue distribution and functional analysis of antibodies reactive for CD166, a ligand for CD6. In Leukocyte Typing IV. Kishimoto, T. et al. eds Garland publishing Inc. New York p. 461-4. Tondreau, T. et al. (2008) Gene expression pattern of functional neuronal cells derived from human bone marrow mesenchymal stromal cells. Wang, D. et al. (2004) Proteomic profiling of bone marrow mesenchymal stem cells upon transforming growth factor beta1 stimulation. J Biol Chem. 279 (42): 43725-34. Green, L.R. et al. (2011) Cooperative role for tetraspanins in adhesin-mediated attachment of bacterial species to human epithelial cells. Infect Immun. 79 (6): 2241-9. Agha-Hosseini, F. et al. (2010) In vitro isolation of stem cells derived from human dental pulp. Bhattacharya, S. et al. (2010) Toponome imaging system: in situ protein network mapping in normal and cancerous colon from the same patient reveals more than five-thousand cancer specific protein clusters and their subcellular annotation by using a three symbol code. J Proteome Res. 9: 6112-25. Ali, H. et al. (2015) Multi-Lineage Differentiation of Human Umbilical Cord Wharton's Jelly Mesenchymal Stromal Cells Mediates Changes in the Expression Profile of Stemness Markers. PLoS One. 10 (4): e0122465. Holmannova D et al. (2016) Effects of conventional CPB and mini-CPB on neutrophils CD162, CD166 and CD195 expression. Prins, H.J. et al. (2016) Bone Regeneration Using the Freshly Isolated Autologous Stromal Vascular Fraction of Adipose Tissue in Combination With Calcium Phosphate Ceramics. Stem Cells Transl Med. 5 (10): 1362-1374. Srouji, S. et al. (2009) The Schneiderian membrane contains osteoprogenitor cells: in vivo and in vitro study. Calcif Tissue Int. 84 (2): 138-45. Katsube, Y. et al. (2010) Restoration of cellular function of mesenchymal stem cells from a hypophosphatasia patient. Gene Ther. 17 (4): 494-502. Fridriksdottir, A.J. et al. (2015) Propagation of oestrogen receptor-positive and oestrogen-responsive normal human breast cells in culture. Brune, J.C. et al. (2011) Mesenchymal stromal cells from primary osteosarcoma are non-malignant and strikingly similar to their bone marrow counterparts. Int J Cancer. 129 (2): 319-30.